The Piers sought a new website to infuse fresh energy into the waterfront redevelopment. While the old website included compelling historic facts, it conveyed none of the vibrant and urbane feel that the three superb restaurants bring to the location. Our new website threw some bold colors and photography into the mix, with a more upbeat and promotional feel. A Web 2.0 interactive environment was developed and a branded UI was designed to reflect the impressive dining and office destination this redevelopment has become. We applied a robust content management system to enable the administrators to update the site with timely information. The website features a full WordPress-based CMS, allowing our client to self publish news and events, update leasing content and make micro-adjustments to page content. 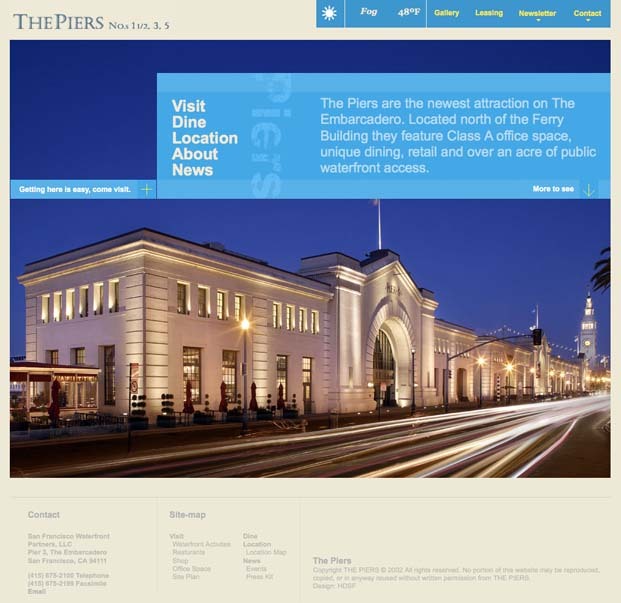 Visit the new site and drop by the piers on your next visit to San Francisco’s waterfront. It’s located at Pier 1 1/2, 3 and 5. Yes, that’s right, Pier 1 and one half!